Ravi Giberson, 11, will no longer be able to receive musical instruction at school because of the drastic budget cuts this year in the Philadelphia public school district. Ravi Giberson has been playing saxophone since he was eight years-old, but his passion for music started long before. Ravi is a fifth-grade student at Cook-Wissahickon Elementary School where he used to receive musical instruction through the Class Itinerant Music Teachers (CMIT) program. That program has since been eliminated due to a $304 million budget shortfall. "Music is really a way for me to express myself. Missing my music classes would be really bad for me because it gives me extra time to practice. My practice time is already so limited,” Ravi said. "It's difficult to imagine going back to school next year with no music." "The outlet for a child who wants to learn an instrument of their choice is disappearing and it’s just not right," Trinette said. 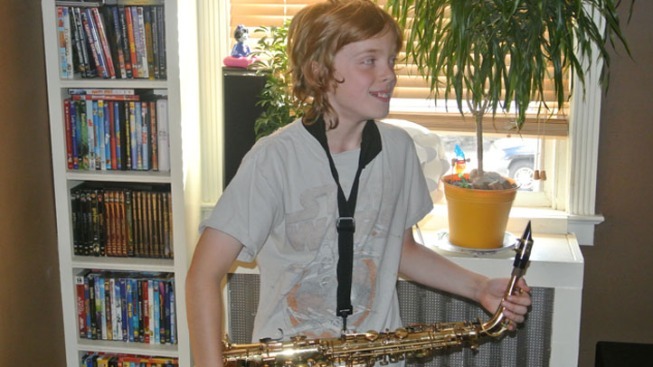 "My son is one of those kids who, without these programs, he would just be lost, and that's no way for an 11-year-old with so much musical passion to be." Hugh Williamson, 42, is one of the 66 CIMTs that have been laid off or reassigned due to budget cuts. The CIMT program delivered small, group music instruction to roughly 10,000 students throughout the city. While he was upset about the layoffs he was more concerned about the impact it would have on students. Williamson taught Ravi for nearly two years. "We were expecting this so I wasn't really surprised. I'm more disappointed for our students because music is a big part of their school life. For some of the kids it’s the reason they go to school," Williamson said. Counseling psychologist and director of Associates for Counseling and Educational Services John Shanken-Kaye says the cancellation of the music and arts as well as sports programs will present problems for students that could affect both their academic development and self-esteem. “Research indicates that music and art programs assist students in other types of learning. Cutting these programs gives them fewer opportunities to be able to develop healthy senses of themselves and further limits their opportunities to show confidence in areas other than academics,” he said. The elimination of programs like CIMT is just the tip-of-the-iceberg for the vast changes students can expect to return to next fall. In addition to cuts to music and art programs, students may also see a reduction in elective courses, a decreased amount of tutoring opportunities, and an increase in class sizes. Shanken-Kaye believes the proposed changes could be very damaging to children in the Philadelphia School District for years to come. “I think that it’s enormously problematic to suddenly take away their favorite programs and their teachers, who were sources of support. I think that we can predict that there’s going to be some increases in anxiety and behavioral problems among students,” he said. To replace the lessons he’ll no longer have with Williamson, Trinette says Ravi has begun taking lessons through Temple University’s Community Music Scholars Program, but future plans for the family are uncertain. Despite being faced with changes beyond his control, Ravi’s love for music remains.